This stop was just to the South of Champs Elysees. I shot here for 10 minutes while my family was on the carousel. I spent seven nights in Paris a few months back and had great intentions of adding to the great series of “A Photographer's Guide to … (Boston, Death Valley, Joshua Tree, Glacier, Philadelphia and so on)” we have seen on the website recently. Unfortunately, our second day there, the whole family came down with something. 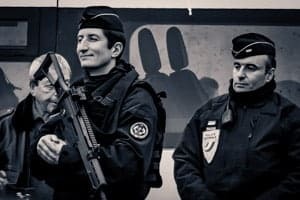 I never fully recovered and, while we forced ourselves to see as much of Paris as we could, I did not have the energy to focus on photography or go out for early mornings or late nights. Because of that, I cannot report back on many of the great photo locations throughout Paris. 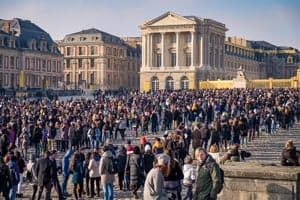 I did pack enough into my good days there that I wanted to share some tips I think will be helpful to photographers going to Paris. 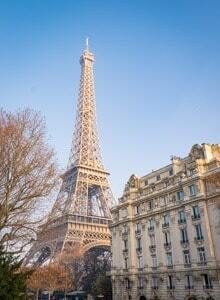 Here are twenty-one tips I gathered while reviewing my images from Paris. This was a very small portion of the Arc de Triomphe. 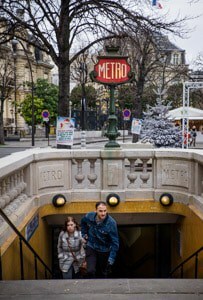 Do a Google search and you will learn there are some pretty famous metro entrances in Paris. Even beyond the famous entrances though, you will find interesting subjects at many of the other entrances. As best as I can remember, each one was unique. They give you a chance to focus on an urban scene, shoot some details, or find interesting subjects for street photography. 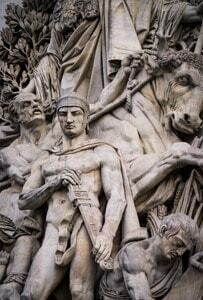 With the Grandiose of Paris, it would be easy to miss the details. That would be a mistake. There are incredible details all over this town. Some of my favorite places to see details were the Arc de Triomphe, Sacre Coeur, Notre Dame, small cafes and random streets. Like other tourist cities, you are going to see a healthy mix of tourists, locals and immigrants. However, I found more interesting characters in Paris than I have in the many other European cities I have been to. For example, you might see someone scamming people with the shell game, a complete fashionista and an angry old lady on the same block. No matter what you are shooting, keep your eye out for the people passing by and be ready to shoot. Unfortunately, the sky didn't light up for me this night. Sacre Coeur is a huge basilica on top of a hill in the north end of Paris. It is a stunning building by itself, but since it is on the top of the hill, it is surrounded by sky with unobstructed sunset views. 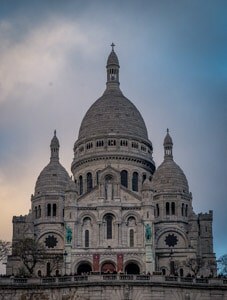 I would recommend heading there well before sunset to spend some time in the streets and park below the basilica, then head up the funicular (free if you have a metro pass). Give yourself plenty of time to go inside the basilica and enjoy making some images inside before setting up for your sunset shoot. Depending on the gear you have, you could get a great image from the top of the stairs or head back down to the park at the base of the hill. Maybe it is just because I am not used to seeing officers strolling through the streets carrying assault rifles, but I enjoyed trying get images of the officers I saw throughout the city. It almost felt like a game because I did not want getting caught making such images in case it is frowned upon (or worse). 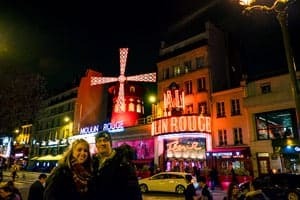 We just made a quick stop by the Moulin Rouge because it was a convenient metro stop on the way home from Sacre Coeur. We were in a rush so I didn't really do photography there, other than having a friend snap a few really high ISO shots of my family, but I could see the potential for night photography. First, it is just outside a metro stop so it is easy access, which is always nice when shooting at night. Second, it is full of great lights. Third, with the street right in front, it would be easy to do some light trails. I never made it back to see the Moulin Rouge during the day so I cannot compare, but I would definitely head back at night if given the chance. 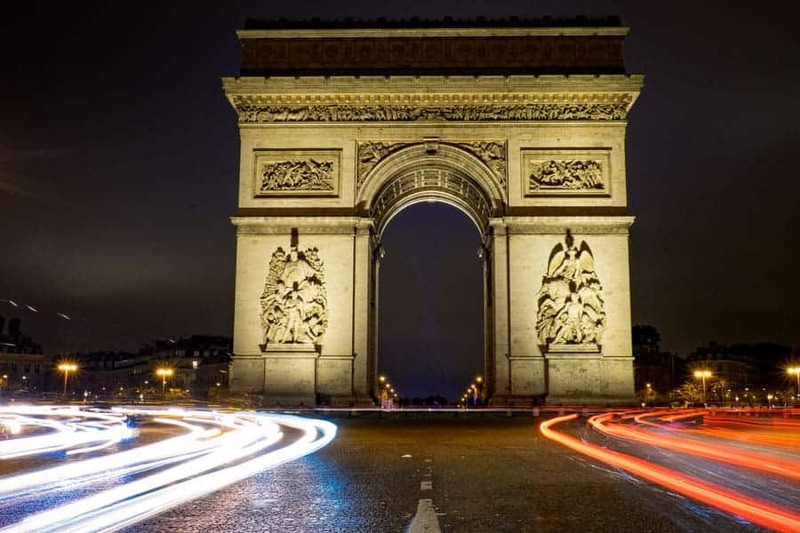 Go to the Arc de Triomphe during the day and then come back at night. It is easy to get to and is well worth multiple visits. I especially loved shooting it at night. Not because it is lit up especially nice, but because most of the tourists are gone and it is set up to capture great light trails circling the Arc. I covered this under the Arc de Triomphe, but Paris is a great place for light trails. The whole city is covered by beautiful buildings that need just a little something extra to make an interesting image. Light trails are relatively easy to make. You just need to set your shutter for however long the cars are going to be crossing through your frame, then adjust your aperture and/or ISO to get proper exposure. If necessary, you can blend multiple images to get the composition you want. If you have an iPhone or an iPad, you really have to check out the Really Good Photo Spots app for the iPhone/iPad. It's so cool! It has thousands of great spots to take photos in just about every city around the world. Paris is particularly well-covered in the app with over 50 spots by my count. The app is free, but there's an in-app purchase if you want the fancier features. My favorite thing about the app is that it had quite a few spots in Paris that I had seen photos of, but I wasn't sure how to get to them or where they were. It's pretty neat. I visited the famous Champs Elysees at both day and night, not because I particularly cared about it, but because it is right next to the Arc de Triomphe. During the day, it did not hold much appeal, just crowds of people walking in and out of stores. At night, on the other hand, there were still lots of people, but they were hanging out under the great lights enjoying photographic interactions with the lighted Ferris Wheel in the distant background. Another image from my early walk around our hotel. 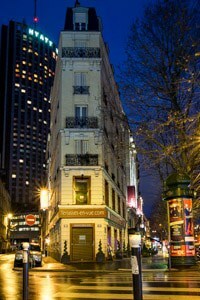 There are great buildings all over Paris that are not tourist attractions. The key is capturing them in an interesting way. If you just shoot them from the sidewalk in afternoon light, they will be pretty boring. In addition to using light trails to add interest, you can work with other interesting light, find some foreground or shoot from a unique angle. Depending what part of town you are in, you may find some pretty awesome doorways. 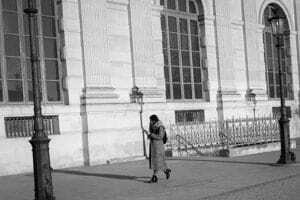 Something I loved about Paris was the lack of uniformity. 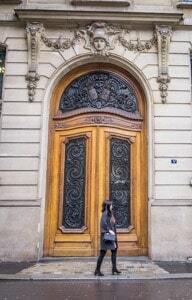 On the same street or the same building, I found completely different and often impressive doorways. I especially loved the narrow streets around the Opera. A block from the Opera. I ended up with four doorway images from this area. View of the Business District from our hotel room. I like getting to high ground for a good view. The problem with doing this is you are usually left with no foreground and a dull image. 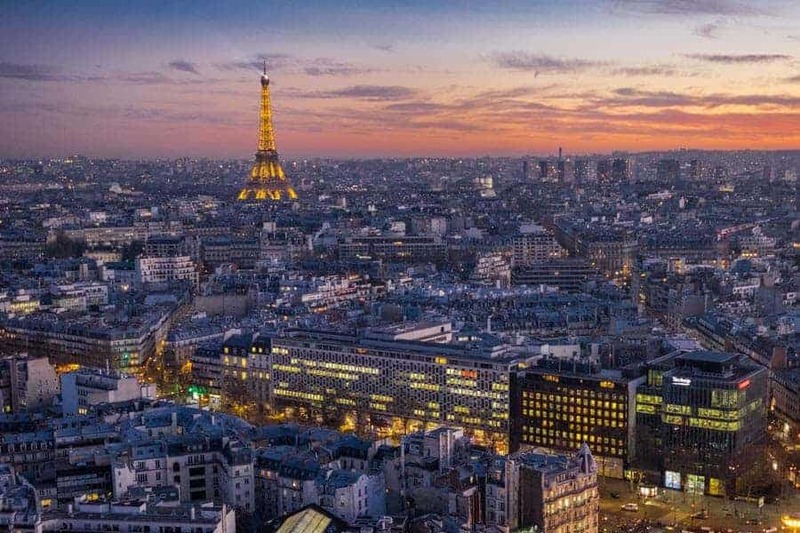 In Paris, there are a number of great buildings that stand above the skyline, including the business district, Eiffel Tower, Notre Dame and so on. There are also many buildings that allow you to get high enough to get a good view of these locations. To make an interesting shot, get just high enough to get a good view and then use the surrounding buildings as your foreground. 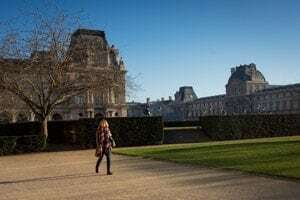 The Louvre, and many other locations, are situated on beautiful grounds and gardens. You can find many great photo opportunities by getting away from the main attraction and exploring the grounds. 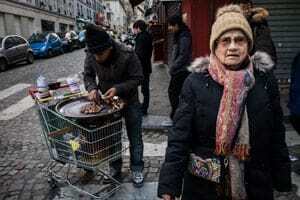 You can often escape to the grounds and find subjects to isolate if you are into street photography. You are also likely to find some good macro opportunities or some interesting foreground for capturing the main attraction. If you want to keep shooting after sunrise or kill some time before sunset, there are some great opportunities to have fun with shadows. With the interesting buildings, you can find a good subject to cast a shadow on an interesting building. 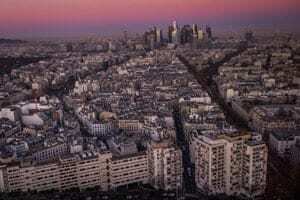 One of the classic Paris shots is the Eiffel Tower above the rest of Paris. For good reason. It is a beautiful scene. I have seen images of it at all times of the day, but it screams sunset to me. Not only do you get the great sky colors, the Eiffel Tower is so much more impressive when it is lit up. Plus, it is an added bonus if you can get some lighted buildings in the foreground to tie the whole scene together. Taken from our friends' hotel room. Unfortunately, I had to shoot through the window as it didn't open. Our line at Versailles. Get there way early if you go. The worst thing about Paris? The lines. Not even close. The lines in Paris are worse than Disneyland. Eiffel Tower, the Louvre, Notre Dame or, worst of all, Versailles. They all have horrible lines. Secret tip, if you have kids, put them in a stroller and they will let you cut the line at the Louvre and Notre Dame. If you are stuck in a line for three hours, like I was at Versailles, try stepping out (if you have someone holding your spot), and capture the ridiculousness of the line with some great scenery. You can also try shooting people playing with the pigeons, some details or use the cobblestone as foreground. Just don't let the line get you down. Instead, think of it as a challenge to find some unique images while you wait. 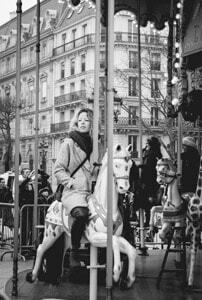 Paris has some great carousels. I recommend the ones at Hotel de Ville and Sacre Coeur. Not only are they both free, they are older and loaded with character. I had fun shooting some details on the carousel and capturing people on them. They also make a great foreground if you have something interesting to shoot behind them. The best place to capture hordes of pigeons is at Notre Dame. Pigeons may be boring on their own, but if place them in front of the beautiful backdrop that is Notre Dame, you are on your way to something interesting. 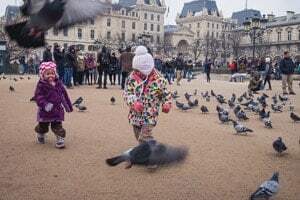 Try capturing some kids chasing them or people panicking when the pigeons land on their head. It will likely be a long wait (if you don't take kids in a stroller), but it will be well worth it. On the day I went, the city was fogged in such that I was robbed of the amazing views. 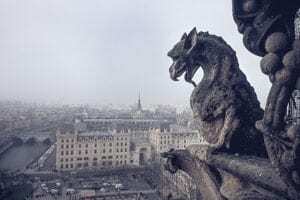 Even so, the famous gargoyles and limited view were still well worth it. 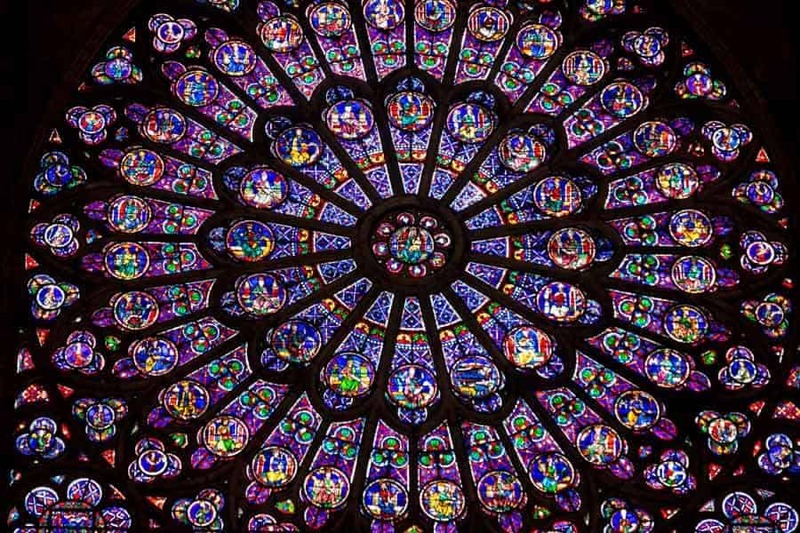 Many of the old churches in Paris have great stained glass. Visit them when the light is streaming through to capture some amazing colors. Experiment with different shots and try and get some foreground with the stained glass to get something unique. I enjoyed getting close to burning candles with the windows in the background. I was surprised just how impressive the Eiffel Tower really is. I was planning to get the token shot of the Eiffel Tower and move on to other things, but it just kept reeling me in. There are seriously unlimited options for different compositions. You have the huge green fields for the classic view, you can go across the street to the carousel, go to some nearby neighborhoods and capture great architecture or get the elevated shot from almost any part of town.